Miss Storytown USA? It’s in living color here! Sometimes you wake up and find a nice surprise in your Inbox. Today was one of those days. I have very special memories of a place called StorytownUSA, which is now the Great Escape, inLake George,New York. One of the joys of today’s Internet is that it grows and grows, and if you’re looking for information or photos of something totally obscure from your childhood, Google it. Chances are you’ll find something—and if you don’t, wait a few months and try again. I’ve reconnected with so many amazing things, things I thought were lost forever, things I thought that only I was obsessed with. Thanks to the Internet, I’ve found there are loads of people just like me. None of us need dwell in isolation anymore. That said, after my father passed away, I got my hands on tons of old photo albums loaded with goodies from my past. Each postcard or random shot of any of the amusement parks we visited became a treasure. There was, however, precious little ofStorytown,USA. 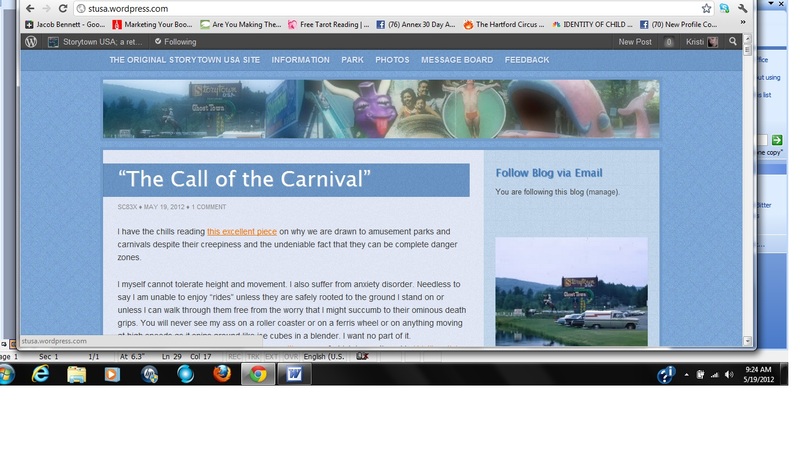 Because of an article I was writing called “The Call of the Carnival,” I wanted more information. I found a wonderful site called Storytown USA; a retrospective at http://stusa.wordpress.com/. I signed up to follow the blog immediately and, although my article “The Call of the Carnival” was published in July 2010, I have never stopped looking forward to the site’s posts. Every few weeks, new information and photos, new details appear. The site, in the past two years, has gotten quite massive. Thank you, universe. I needed that today. Posted on May 19, 2012, in Deep Thoughts & Fun Stuff and tagged abandoned amusement parks, Great Escape, Lake George New York, old amusement parks, photos Storytown New York, Storytown USA. Bookmark the permalink. 1 Comment. thank you so much (^_^) this gave me smiles after such a wishy washy work day! more people need to remember and write about it because it often sparks memories in others. i’ve thought about trying to get to the park this year but..ugh..after remembering what they did to goosey ganders castle, i got a little turned off. and after 2005 i vowed to never return, because too much had been changed for me to actually enjoy it anymore. that saddens me. but part of me really wants to go back just one last time. we’ll see.